Go to "Options", then "Defalt Options", then "Miscellaneous". Tick the "Enable game cheats" box. Start the game you wish to play. Press the tilde key "~" to bring up a small black menu at the bottom of the screen (on a UK keyboard, press the top left "`" key, next to "1"). Navigate this menu using the arrow keys, up or down until you get to something like "Overclock CPU0 100%". Adjust the percentage downwards to slow the game down, using the cursor keys LEFT and RIGHT (hold down CTRL at the same time for fine tuning). Press the tilde key "~" again to turn off the on-screen menu. Use F10 to toggle between top speed and selected speed, to hurry you through any sluggish menus. Some games have more than one CPU (Central Processing Unit - or brain), but usually CPU0 is the right one. Slowing down the processor can give strange effects with certain games, so experiment until you get satisfactory results. If this doesn't work, there is an alternative method that seems to work with all games, using a utility that slows down your entire PC at your control. You will need to go into the advanced properties of the game you wish to slow down, then set "Frame Skipping" to "Draw Every Frame". You will also need to switch off the technical features "Match game refresh rate", "Sync monitor refresh" and "Wait for vertical sync". Arcade: MAME or MAME32QA with legal games from StarROMs and slightly dubious games from Rom-World.com. 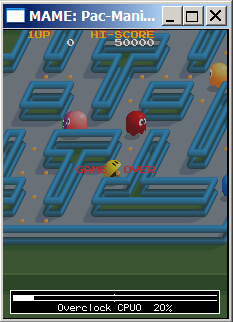 Add cheats to make play easier via Pugsy's MAME Cheats. For help obtaining or using this system, please e-mail.